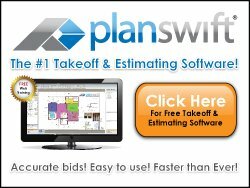 Using electrical estimating software will accelerate your development of estimates in and of itself. However, here are some additional estimating tips which will make you even more efficient and speed up work. Electrical estimate highlights: Use a highlighter when doing a material take-off - When you do a material take off, mark (color) each item as you count it with a high lighter or a colored pencil. By marking everything as you go, you can quickly scan the plan and tell what has been counted and what has not. Electrical Estimate conduit take off: Use a Scalex digital rolling measuring tool to take off conduit - The scale is different for different pages on the blueprints. Make sure that you set the scale correctly for the page you are taking off. Stay on task and show your thoughts - Make notes, draw diagrams and pictures on the plans or separate sheets of paper of solutions or methods you used to prepare the estimate. This will leave a trail to remind you later or let others know what you were thinking. Add additional materials for waste - Since there are wasted materials on every job, it is necessary to add for waste in your estimate so that you do not come up short on your material budget. Conduit and wire are often the areas of most waste. Ten foot pieces of conduit are often cut short and wire has left-overs of partial spools. Some of the waste could be prevented and some will just happen. Example: Electricians are pulling 4- #8 wires in a 1" conduit run. They get close to the end of the spools and change the spools out for new ones and there is another 80 feet left on the spools (80 feet X 4 wires = 320 feet of waste). If there is not another short run that they can use the wire for it is wasted. Good foremen (good electricians for that matter) will be creative and use the short pieces of wire to feed AC units or other equipment and use up the short pieces as much as possible. The amount of wasted conduit and wire vary greatly depending on your supervision. You must train your job foremen and superintendants to keep waste to a minimum. Tip:- When creating an electrical estimate, the absolute best way to determine how much waste to estimate for a job is to have a track record of previous jobs that you have completed. Case Study - Cost overrun on MC cable and branch conduit. Question. Did you purchase more branch conduit and MC cable than estimated on previous job(s)? When determining waste for an electrical estimate, make sure that you use track records of the same type of job that you are bidding. If you are bidding a tenant improvement job, make sure that you use the waste percentage for that that type of job. Example: The average job may run approximately 10% over in cutting waste for conduit sizes 1" and below and 15 to 20% (or more) for MC cable and small wire Size #6 and down. Make sure that you add something for waste so you do not come up short on your material budget. Set up a color code for your material take-off It does not matter what colors that you use for what. Just make sure to be consistent and use the same colors for the same code each time. Set up a systematic standard that is used by everyone in your organization. When doing a conduit take-off for the electrical estimate, take-off all conduits at right angles to the plan (all 90 degree turns). Do not take off on diagonals. By measuring at right angles, you allow enough conduit and wire to go around minor obstructions. Wire make-up length is the distance that the wires must extend out of the end of the conduit, so it can reach the make-up point. When doing a conduit take-off, it is necessary to add enough wire length to reach the make-up point. You must consider how much make-up length is needed at both ends. Example: Say that the conduit lands at the top of a 7' 6" switch board. You must include enough wire to reach from the end of the conduit to the breaker, lug, or make up point, where the wires are to be made up. In this case, you may add as much as 10 feet of extra wire for just one end. Note that if there are 3 wires in the conduit, you would add 10 feet X 3 wires. You must also include make-up length for the ground wire. Wire make up for feeders is usually 7 feet for switchboards and 5 feet for panel boards. Wire make up should also be included when you are pulling thru pull boxes or junction boxes. When you use the methods above, creating an electrical estimate becomes systematic. By being systematic, you gain speed and accuracy. When you gain speed and accuracy, you can increase the number of estimates that you do weekly or monthly, and increase your business volume.